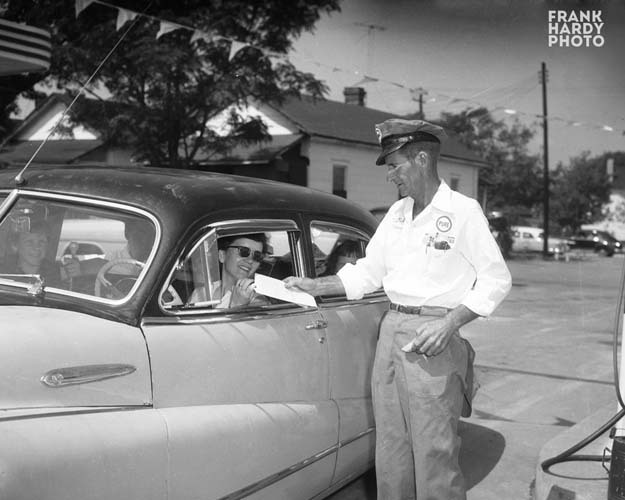 How many of you can remember going to a ” Filling Station ” and having someone come out to your car to ” service ” your car? And be happy to do it! I do not recognize any of these ” attendants ” or the stations were they are working. These photos were made back in the 1950’s and I did not start driving until 1969, but I can still remember going to service stations. I do not think that they were phased out until sometime in the late 1970’s and maybe up until the mid-1980’s, when everything became ” self-serve “. 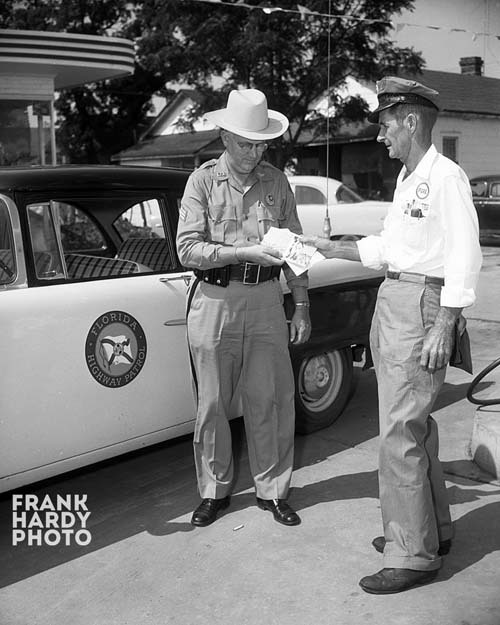 This FHP patrolman looks like a nice guy … I bet he would let you off with a “warning”, something that the FHP patrolman now seem to have never heard of. A speeding ticket back in the 1950’s most likely only ran $25 or so, now, you are looking at upwards of $200 or more. The sign on the wall says C.E. Bowden and that name does not register anything to me. The area next to his building looks like a row of buildings that you might find in some of the rural towns around the Florida Panhandle back in the 1950’s. I am thinking Marianna, Chipley, Milton … some little town off of Highway 90. 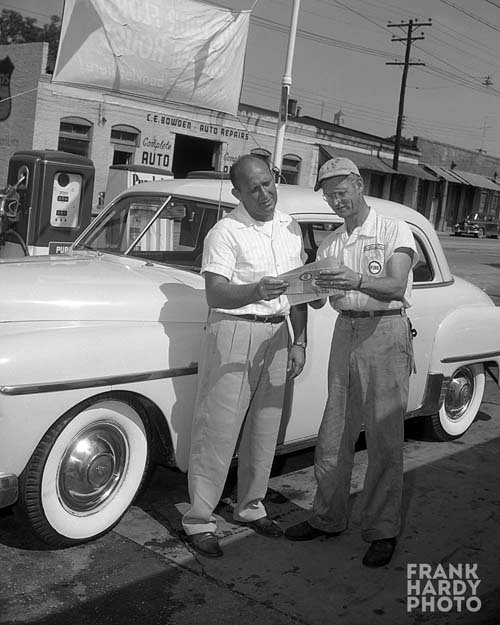 For years (40’s and 50’s) my father always bought gas in the Pensacola area from Mr. Alday’s Pure Oil Station in Warrington. The ritual was always the same: Slim, in his Pure Oil uniform complete with hat, would come out smiling and say, “What’ll it be today, Mr. Baldwin?” My father would reply, “Fill ‘er up, Slim, check it under the hood.” “You want me to check the tires, Mr. Baldwin?” There would be a judicious pause while Dad and Slim looked the tires over. If it drew out too long without a decision, Slim would say something like, “That right rear looks a little low. Maybe I better check it out.” Under the hood, everything got checked by Slim, or, if he was busy, Skippy might come out of the garage to help out, or even Mr. Alday himself, if needed. I realized I better always mind my P’s and Q’s one day when I was about 10 and needed to use a phone to call my parents. I went into the filling station and asked if I could use the phone. One man, whom I did not know, told me no, but just then, Mr. Alday came up and said, “Aren’t you Mr. Baldwin’s boy?” When I replied that I was, he told them to let me use the phone. It was then I realized that the people at the grocery store, the hardware store, the pharmacy, the shoe repair shop, the barber shop, and a great many businesses in Warrington knew who I was and that I had better not get in trouble because there were a lot of people who knew my parents.